I've been wanting an adorable cupcake charm for quite a while (is that strange?) I've been looking all over for one with just the right amount of realism and cuteness, and I think I've found a winner in Claybaby's adorable polymer clay products! I really think the items in Claybaby's Clay & Me Etsy shop are the most adorable cupcake charms that Etsy has to offer. 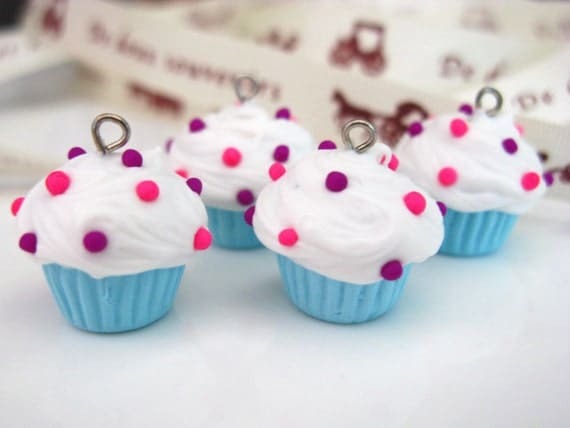 I ordered the set of 4 blue cupcake charms pictured above for just $5.00 + $3.50 shipping. I think that's a pretty good deal since they came all the way from the Philippines. It also makes me feel good to support and artist who is working entirely by hand. But you, my dears, won't have to pay shipping because, for a limited time, shipping on all orders is free if you enter the code BIG100 at checkout. Shipping is standard mail unless you choose otherwise and takes 2-4 weeks. As you can see from my (poorly-lit) photo, each cupcake fits onto a quarter and has a hook on top for stringing on necklaces, phone chains, you name it. (For stringing on a necklace, you'll need to attach a jump ring first.) The pieces are made of polymer clay, which can be fragile, and they are tiny and chokeable so I wouldn't recommend giving these to small children. ClayBaby actually has a policy that they are not liable for any breakage after shipping--and, while packed well in a plastic egg, two of my cupcakes did lose a single sprinkle. Nothing a little craft glue can't fix, though! ClayBaby offers other charms--from cakes to Kokeshi dolls--that are super adorable. Carla--the woman behind ClayBaby--also does custom clay orders such as cameos, floral rings and pendants that are GORGEOUS. Check out her Facebook page for galleries that will make you want to shop! Thanks for stopping by and following, I'm now following you back! Oh my goodness! That cupcake charm is so cute! I have a thing for cupcakes and sprinkles and that charm is just adorable! Oh, and I wanted to let you know you have the cutest header I have seen in quite awhile! I love the little birds and the bright colors!